For automatic speech recognition (ASR) systems it is important that the input signal mainly contains the desired speech signal. For a compact arrangement, differential microphone arrays (DMAs) are a suitable choice as front-end of ASR systems. The limiting factor of DMAs is the white noise gain, which can be treated by the minimum norm solution (MNS). In this work, we introduce the first time the MNS to adaptive differential microphone arrays (ADMAs). We compare its effect to the conventional implementation when used as front-end of an ASR system. In experiments we show that the proposed algorithms consistently increase the word accuracy up to 50% relative to their conventional implementations. For PESQ we achieve an improvement of up to 0.1 points. 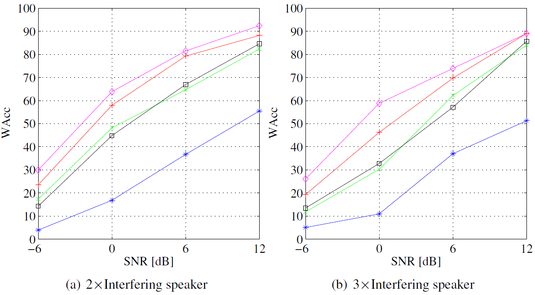 The figure shows the WAcc for speaker scenarios with a target speaker and two or three interfering speakers, for different SNR values. We see that for every scenario and SNR condition all ADMAs increase the WAcc compared to a single omnidirectional microphone front-end. With our robust implementations of the ADMAs (red, magenta) we achieve an improvement of up to 50% compared to their conventional implementations. Legend: (blue) Single omnidirectional microphone; (green) First-order ADMA (number of microphones M = 2); (red) Robust first-order ADMA (MNS: M = 4); (black) First/second-order hybrid ADMA (M = 3); (magenta) Robust fist/second-order hybrid ADMA (M = 5).